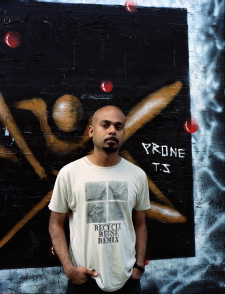 Siddhartha Bose is a poet and performer based in London. He grew up in Bombay and Calcutta, followed by a seven year itch in the USA. Selections of his work have appeared in the anthologies City State: New London Poetry and Voice Recognition: 21 Poets for the 21st Century. Bose has recently completed a PhD at Queen Mary, University of London. He is playwright-in-residence with WhynotTheatre, Toronto, and was dubbed one of the 'ten rising stars of British poetry' by The Times. His debut collection, Kalagora, was recently published by Penned in the Margins, and he premieres his solo stage show at Rich Mix on Thursday 21st October. This poem was published in City State: New London Poetry (Penned in the Margins, 2010), which showcases the work of 27 London writers. From hyperlinked walks of Battersea bombsites and guerilla gardening projects to jagged urban lyrics and dark hymns to the East End, City State presents a confident, entertaining and truly diverse snapshot of the best new poetry from London. Cat in my voice a queen. You, ever in reserve, shied. Felt I'd lost my wallet. Cheap vinyl, soggy crêpes, torn jeans, pillpoppers. Bled me with the damp of a morning star. Dungeon of a broken house, peeled windows. Some paint on scorpio bodies. Others hiss on cheap blow. My eyes trance in redn'green shapes. City State is available to buy from Amazon and Waterstone's, £9.99. Kalagora by Siddhartha Bose is also available from Amazon and Waterstone's, £8.99. Siddhartha's solo stage show is at Rich Mix on Thursday 21st October, 8pm, £8 / £6. See the Rich Mix website for more details.